A space tether is a chord, cable, or wire connection between a spacecraft and another object in orbit. The earliest tethers were those used as life-lines for astronauts carrying out spacewalks during the pioneering Soviet and American manned orbital missions. Much longer space tethers, however, provide a means of deploying probes to study Earth's outer atmosphere or generating electricity to power a spacecraft or space station. 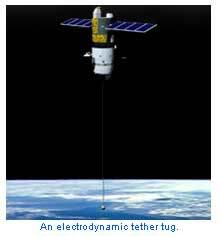 A number of such tethers have already been flown on missions such as SEDS (Small Expendable-tether Deployer System), TSS (Tether Satellite System), TiPS (Tether Physics and Survivability experiment), and STEX (Space Technology Experiments). The ability of a tether system to produce electric power was demonstrated by PMG (Plasma Motor/Generator). NASA's Marshall Space Flight Center now plans a more sophisticated version of PMG to show that an electrodynamic tether can serve as propellant-free space propulsion system – a breakthrough that could lead to a revolution in space transportation. A pure momentum-exchange (MX) tether doesn't create orbital energy; it only exchanges it. This exchange of momentum takes place very quickly (within a few minutes), and increases the orbital energy of the payload dramatically. This dramatic increase in the payload's orbital energy comes at the expense of the tether station. As it catches and throws a payload, its orbital energy is reduced, and it assumes a lower orbit. Without reboost, it will soon lose enough orbital energy to burn up in the atmosphere. Hence, without reboost, the MX tether would soon be useless. Any type of propulsion system, in theory, could be used to reboost an MX tether. Chemical, nuclear, and electric are all options, but if rocket reboost is used, the MX tether station will have to be refuelled regularly, and the entire tether system will be no more efficient than the reboost rocket. A propellantless form of tether reboost would be ideal. A purely electrodynamic (ED) tether is a propellantless system, but it is limited to the regions above the Earth where the ionosphere and magnetic field are relatively strong (less than 1,000 kilometers). It collects current from the ionosphere to flow through its conductive tether. That tether acts like a wire moving through the field lines of the Earth's magnetic field; consequently a J × B force is exerted on the system. The ED tether can passively generate power (at the expense of orbital energy) or use a power supply to drive current through the tether and create thrust (increasing orbital energy. In theory, an ED tether could dock with a payload and slowly spiral up to a higher orbit, then release it and spiral back down. However, the ED tether is limited to altitudes less than 1,000 kilometers, and achieves performance similar to other low-thrust, high-power propulsion systems (such as ion engines) which have very low thrust-to-weight ratios. The MX and ED tethers, by themselves, do not achieve exceptional improvements in performance over existing technologies. The MX tether is hobbled by a reboost requirement, and the ED tether is constrained to operate at low orbital altitudes. However, a hybrid of the two, the momentum exchange / electrodynamic reboost (MXER) tether, may be capable of breaking through these limitations and enabling a powerful, propellantless system for orbital transfer. In principle, a MXER tether in an elliptical orbit could catch a payload in a low Earth orbit, carry it for an orbit, and then throw it into a higher energy orbit. The entire procedure would only take a few hours. It can then employ electrodynamic reboost over a much longer period to restore the orbital energy it gave to the payload. Hence, the tether system can give the payload all of the efficiencies of a "high-thrust", impulsive orbit transfer, but slowly reboost itself using only electricity.